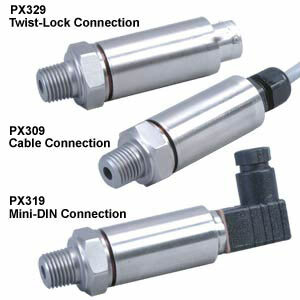 OMEGA’s PX309 Series high performance general purpose pressure transducers use two state-of-the-art silicon technologies. Pressure ranges below 100 psi use a high-accuracy silicon sensor protected by a fluid filled stainless steel diaphragm. Ranges 100 psi and above use high-accuracy silicon strain gauges molecularly bonded to the stainless steel diaphragm. Both systems provide a rugged sensor with high accuracy and excellent long term stability. FAST DELIVERY ON MOST MODELS! Typical Lead time is stock or 1-2 weeks if not in stock. Most Popular models are featured in the "To Order" below. For the full selection of all models available, see the "Part Number Builder" below the "To Order" table. The PX309 is also available in metric configurations, with ranges from 0-70 mbar to 0-700 bar and G 1/4 (1/4"BSPP) metric fitting. Please see the PXM309 for complete details, or contact our Sales department for more information. 0-5 psia (0-0.34 bar) absolute pressure range. 0-15 psia (0-1 bar) absolute pressure range. 0-30 psia (0-2.1 bar) absolute pressure range. 0-50 psia (0-3.4 bar) absolute pressure range. 0-100 psia (0-6.9 bar) absolute pressure range. 0-200 psia (0-14 bar) absolute pressure range. 0-300 psia (0-21bar) absolute pressure range. 0-1 psig (0-0.07 bar) gauge pressure range. 0-2 psig (0-0.14 bar) gauge pressure range. 0-5 psig (0-0.34 bar) gauge pressure range. 0-15 psig (0-1 bar) gauge pressure range. 0-30 psig (0-2.1 bar) gauge pressure range. 0-50 psig (0-3.4 bar) gauge pressure range. 0-100 psig (0-6.9 bar) gauge pressure range. 0-150 psig (0-10 bar) gauge pressure range. 0-200 psig (0-14 bar) gauge pressure range. 0-300 psig (0-21 bar) gauge pressure range. 0-500 psig (0-34 bar) gauge pressure range. 0-1000 psig (0-69 bar) gauge pressure range. 0-2000 psig (0-138 bar) gauge pressure range. 0-3000 psig (0-207 bar) gauge pressure range. 0-5000 psig (0-345 bar) gauge pressure range. 0-7500 psig (0-517 bar) gauge pressure range. 0-10,000 psig (0-690 bar) gauge pressure range. -15 to +15 psi (compound gauge), -1 to +1 bar compound gauge, 12mA at ambient pressure.